PMC’s Sleep Services provide assistance to physicians in the diagnosis and treatment of adult patients with sleep disorders. Our Sleep Centers are under the direction of a physician who is board certified in adult sleep medicine through the American Board of Sleep Medicine(ASM). 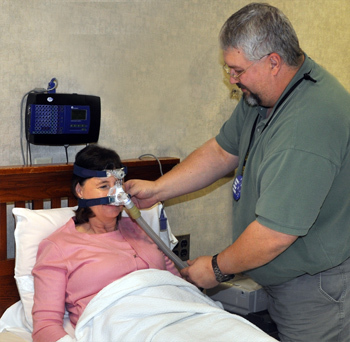 Included in our staff are Certified Polysomnographic Technologists, and Respiratory Therapists. Sleep disorders effect the quality of life, and when untreated can cause hypertension, diabetes, stroke, cardiac complications, and possibly death. Drowsy driving that is associated with sleep disorders is often linked to motor vehicle accidents. Sleep disorders are treatable through different modalities that will be determined by the sleep physician. The Sleep Center, now located at The Landmark Hotel, provides and treats a wide array of sleep disorders, including Obstructive Sleep Apnea, Narcolepsy, Insomnia, and Restless Leg Syndrome. The Whitesburg Sleep Center is located at 60 Main Street in Whitesburg. The facility consists of two beds and serves residents that live in that part of the state. The Pikeville and Whitesburg locations are fully accredited by the American Academy of Sleep Medicine.